Would it surprise you to learn that to solve a seemingly unsolvable problem, you need to get up and leave the room? A walk in the woods will help you finish your novel? Humming can make you a better tennis player? Or completely giving up is the way to succees? More than three decades ago, Dr. Herbert Benson began to research why some people are devastated by stress while others thrive, turning it into brilliant achievement. The Breakout Principle reports the discovery of an easy-to-access inner switch that increases mental function, enhances creativity and productivity, maximizes athletic performance, and enriches spiritual life. The same internal mechanism that improves tennis serve or golf putt strengthens your speaking skills, makes you a better negotiator, and fosters inner peace and belief. 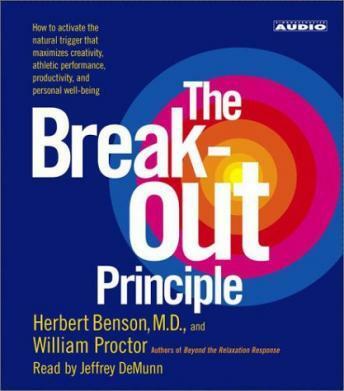 Dr. Benson and co-author William Proctor explain the cutting-edge science behind the phenomenon in accessible language, clearly describe the four distinct phases of the Breakout, and provide simple, step-by-step instructions on how to activate the Breakout 'trigger.' The Breakout Principle reveals how to maximize your untapped abilities and powers. This book promises to teach you to trigger a "break-out" in any aspect of life, making this the uber-self-help book. But the steps to achieve a "break-out" are explained in detail early in the book, and the rest of it is spent dwelling on those details in further excruciating detail. He's a big advocate of showering and prayer as break-out "triggers". I usually dislike abridged books, but I wish this one was. The first two disks are where the meat is; the rest is just parsley on the plate. There are a total of 4 CDs with this and you only need to listen to the first two CD's to get the concept because he repeats himself so much. I did not like it that much and really would not recommend.